Needs a new manager and staff - they don't have a clue! Nice pub. Shame about the staff. Large, popular Greene King pub on the Thorley estate. Serves the usual pub food, most meals under �10, don't expect high quality though. 2 meals for �8 before 8pm is probably the best deal they do. Waiting times for food may be quite long at peak periods. Greene King IPA, Abbot Ale and Belhaven best are the bitters. Kronenburg and Fosters lager on sale too. Usual selection of spirits and softs. Strongbow, magners and kopparberg are the ciders. Beer well-kept and well priced for the area at �2.40 a pint of IPA. Ale has been known to run out before, due to the volume of customers but this is very rare. Possibly the cheapest pub in the Stortford area, the Marne down the road might lay claim to this title too! The Harvest moon is an old building with exposed beams, yet manages to get the old/modern balance just about right. Carpets and a modern floor by the bar compliment the historic features well. 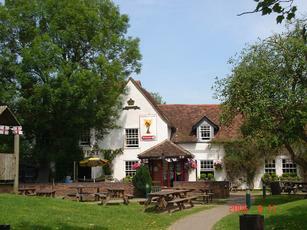 This pub gets very busy in the summer, both daytime and evening. Client�le are a mixed bunch, older people and families in the day, and often younger people from the local area at night. Staff are friendly and talkative. No separate rooms but the pub is split up into different areas, with bar stools and a TV to the right, leather sofas near the main entrance and larger tables for eating to the right. Clean and tidy appearance throughout. This pub is looked after well. Heated smoking courtyard to the rear. Large car park to the front. Took the dog for a walk in the spring and stopped off for a pint, sitting outside. All of a sudden a hail storm started and the miserable git of a landlord wouldn't let me, dog and kids shelter in the side entrance! Said we were blocking a fire exit, as if we wouldn't have been the first ones out if the place caught fire.